An alley of 30 baroque statues and statuaries erected during the late 17th and the early 18th centuries decorates Charles Bridge. These statues and statuarities depicting saints is the key point here. They do not only form a unique connection of artistic styles – Gothic and Baroque. Touching one of them will ensure you good luck, guarantee your return to Prague and you can make a wish as well. Are you keen on which one is it? Statue of St. John of Nepomuk You have to find a statue of St. John of Nepomuk. It is the 8th statue on the right hand if you are heading from Old Town Square towards the Prague Castle. If you don’t want to count, it may be easier for you to look for the shiny-like-gold spot on the bottom of one of these statues. John of Nepomuk was a priest in Prague under King Wenceslas IV (son of Charles IV). The priest received the confessions of the Queen. Unfortunately for John of Nepomuk the King was a very suspicious man. He wanted to know the Queen’s confessions which Nepomuk would not reveal, not even to the King, because it would be against his commitment of confidentiality. Nepomuk was therefore executed by being thrown into the Vltava River from the bridge and drown. Jan Nepumucky - the falling priest on the plaque The plaque on the statue of John of Nepomuk has been polished to a shine by countless people having touched it over the centuries. Touching the falling priest on the plaque is supposed to bring good luck and ensure your return to Prague. 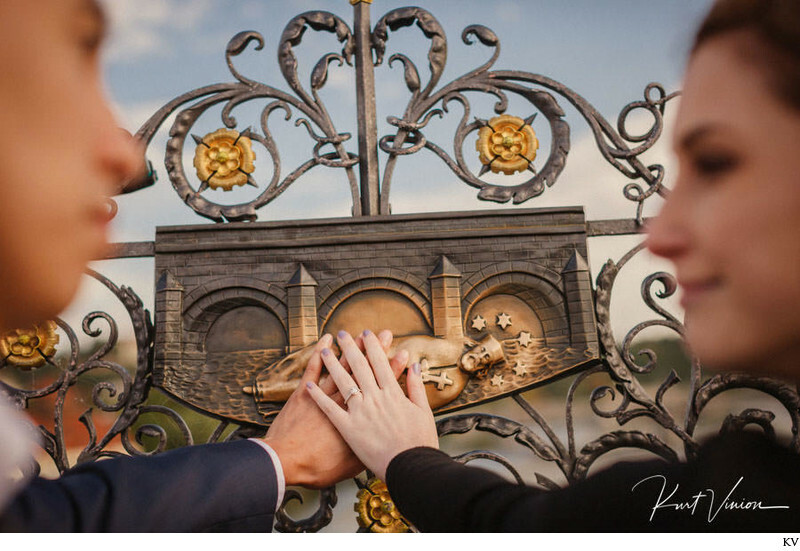 Keywords: Charles Bridge marriage proposals (3), magazine styled pre-wedding photos (165), Old Town Square (189), Prague (795), Prague engagement photos (321), Prague pre wedding photography (165), Prague pre-weddings (171).